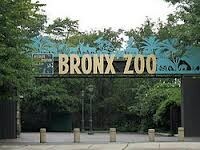 Join Perkiomen Tours on a trip to the largest urban zoo in the nation - the Bronx Zoo! Lions and tigers and bears - OH MY! You will also see many more animals than just lions, tigers and bears on this trip to the Bronx Zoo. 650 species to be exact! The Bronx Zoo has more than just animals to experience. There is a 4D Theater, Jungle World, Zoo Shuttle, Wild Asia Monorail, Children's Zoo, Congo Gorilla Forest, Butterfly Garden and Bug Carousel. Your total experience ticket provides zoo admission and unlimited access to special rides and attractions. These may include the 4D Theater, Jungle World, Zoo Shuttle, Wild Asia Monorail, Children's Zoo, Congo Gorilla Forest, Butterfly Garden and Bug Carousel. Lite food stop en route home not included in the cost of the tour.